So I got ‘schooled’ after my recent post about seed saving. I was all excited to be pulling seeds from last year’s Zephyr squash and thought I was going to share them with others at the Good Food Festival Seed Swap, but, well, my dear, sweet farmer friend Vicki Westerhoff of Genesis Growers emailed me to straighten me out. I’m really glad she did and thought her writing was so thoughtful and clear that I wanted to share much of it with you. I learn from my farmer friends and you should too! “Grant, not to daunt your efforts, nor your enthusiasm, but the Zephyr squash is a hybrid if I remember correctly. You can seed save from a hybrid, but may come up with a mixed heritage plant for your second generation. They may grow true to type, but just as easily they can revert to their own parentage. When you seed save, watch for crops that are open pollinated and/or heirloom. You will have the best success with those. Tips: During the growing season watch your plants. Select more than one plant to obtain seed from so you have more genetic diversity. Select plants that have traits you want to have continue: i.e. insect resistance, beautiful fruit, hardiness, etc. Then tag those plants and save seed from those tagged plants. By doing this, you will find you seed stock is stronger and will produce a better crop the following year. “I do grow Zephyr and my seed is not organically grown, but it is untreated which works for organic agriculture if an organically produced seed is not commercially available. A seed cannot be treated with any chemicals and be used in organic agriculture, but untreated conventionally grown seed can. As a grower I have to document a search for a particular seed that is organically produced before using the other type, but like I said it can be used and not eliminated from certification. Hybridization is fine for organic agriculture. A GMO is not. 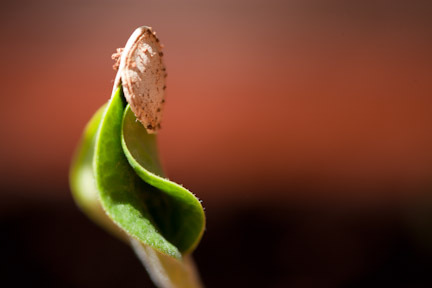 Hybrids are developed following a natural process in which the same family of plant is cross pollinated to produce a seed that produces characteristics of both parents. This process is as old as agriculture. An example: Farmer Joe has a tiny tomato with superb flavor and a large tomato with beautiful large shape. He grows both plants and then pollinates only those two varieties with each other to hopefully produce a medium size extremely flavorful tomato. This process takes many years of crossing and testing the resultant tomatoes and re-selecting over and over the traits one finds favorable until there is a new variety of tomatoes: Farmer Joe’s Tasty Tomato. 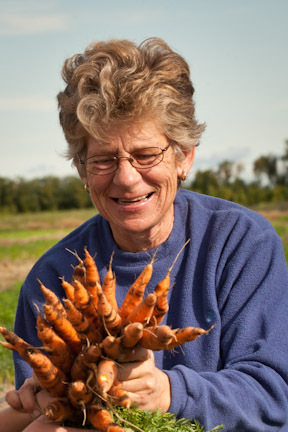 I don’t know about you, but I love that a farmer like Vicki can both produce Farmer Vicki’s Tasty Everything and teach others about what she does! She’s a treasure in my foodshed, that’s for sure!